bartlett mitchell, one of the UK’s leading independent caterers, has ensured more than 5,000 people will have access to clean water with the donation of its 50th water pump via its Thirsty Planet water programme. 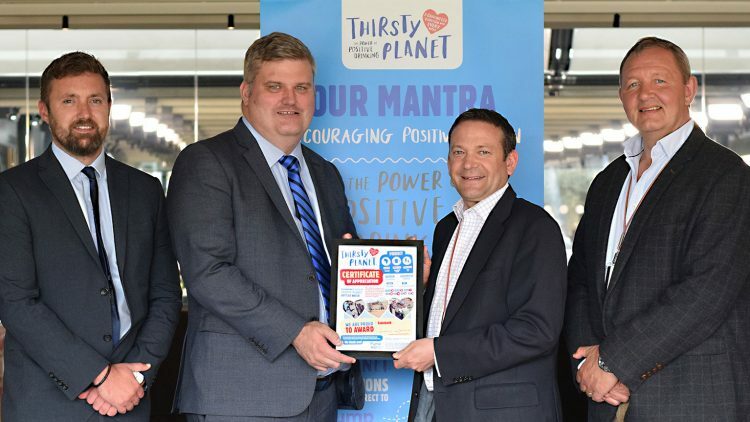 The company, which first launched the initiative to sell bottles of Thirsty Planet at participating client sites in 2013, donates 4 pence from every litre purchased to Pump Aid – a British charity that helps rural communities in remote sub-Saharan Africa to have a constant source of safe, clean, drinkable water by installing specialised water pumps. To date, bartlett mitchell has donated enough funds to install more than 50 pumps, providing enough drinking water for people across the Mchingi district of Malawi. As part of the initiative, bartlett mitchell allocates pumps to clients and, as their customers purchase enough water to procure a pump, the company is able to work with Pump Aid to build a new facility. Clients are then provided with the exact coordinates of their pump so they know where it is located, and how many men, women, children and orphans have access to clean water as a result of their donation. The 50th pump was donated on behalf of Rabobank, a Dutch food and agribusiness bank, located on Lower Thames Street, London. The ‘elephant pumps’, made from local equipment, are community driven and owned. The community are trained to repair and maintain the equipment which ensures long-term and sustainable use of the pumps. The programme forms part of the company’s ‘Fruitful World’ Corporate, Social and Environmental Responsibility activity which aims to encourage long-term profitability with maximum social responsibility and environmental care. bartlett mitchell aims to have funded 70 wells by December 2017.